Voted one of the greatest comedians of all time, Jerome Allen “Jerry” Seinfeld started his career at an open-mic night after graduating from college. He found his way to a Rodney Dangerfield HBO special, then appearances on late night talk shows, and small roles in little-known sitcoms. Finally, in 1989 he created The Seinfeld Chronicles along with fellow New York Jew Larry David. By its fourth season (then known simply as Seinfeld) it had become the most successful sitcom ever, and made Seinfeld the highest-paid celebrity of the time (he earned $267 million in 1998 alone!) 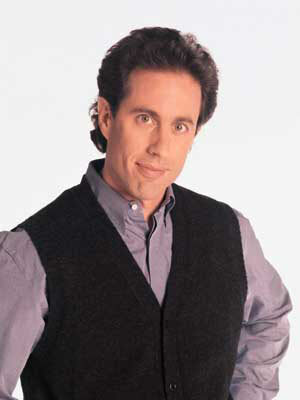 Seinfeld is also a bestselling author and winner of multiple Emmy and Golden Globe awards. Interestingly, his father was Austrian Jewish, and his mother’s family is Syrian Jewish, having immigrated to the US from Turkey. Seinfeld also worked in an Israeli Kibbutz when he was 16. Meanwhile, Lawrence Gene “Larry” David co-created and wrote 62 episodes for Seinfeld, including “The Contest” which won the distinction of being the best TV show episode of all time. Previously, he was a writer for Saturday Night Live, and many other comedy shows. 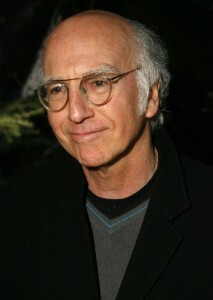 Larry David is most famous for starring in Curb Your Enthusiasm, a unique show where the script is improvised by the actors as they are being filmed. It has been both criticized and praised for its heavy emphasis on Judaism and Jewish themes, and the show is thought to be based on the Yiddish archetype of a “schlemiel”. Like Seinfeld, Larry David is an author and winner of multiple Emmy awards. This entry was posted in Arts & Entertainment and tagged American Jews, Austrian Jews, Author, Brooklyn, Comedians, Comedy, Curb Your Enthusiasm, Emmy Award, Golden Globe Award, HBO, is jerry seinfeld jewish, is larry david jewish, is seinfeld jewish, Israel, Kibbutz, New York, Rodney Dangerfield, Saturday Night Live, Schlemiel, Seinfeld, Sitcom, Syrian Jews, Talk Shows, Turkey, Yiddish on September 12, 2012 by Jew of the Week.